As WikiMania, the annual conference for the Wikipedia faithful, gets under way, there is bound to be much back-slapping over the successes of an encyclopaedia that has become, in the words of one devotee, "part of the assumed plumbing of society". But behind the scenes, or rather behind the screens, lies a world of incessant cyber-bickering, in which some editors of the site conduct "battles to the death for insanely low stakes" - as veteran contributor David Gerard puts it. He is referring to the infamous "edit wars", in which the volunteers who spend hours creating and policing Wikipedia - affectionately known as Wikipedians - clash over the minutiae within the site's 30 million or so pages. So, debates rage over whether Flo'Ball is an actual sport - do a few YouTube videos of people supposedly playing the game count as "reliable coverage"? And there are arguments over whether an article on Nazis in space even belongs on Wikipedia. Image caption A recent Wolfenstein game put Nazis in space, but does the genre deserve its own entry? Is it a "well known theme in alternate history science fiction", or just a bonkers "conspiracy theory"? (The jury is still out). Aside from the many philosophical altercations, most conflict centres on how to interpret Wikipedia's house guidelines. NPOV, or neutral point of view, mandates Wikipedians write "fairly, proportionately, and, as far as possible, without bias". Except when it comes to polar bear cubs. The Wiki faithful have been arguing - and arguing, and arguing - about whether describing an animal, or baby, as being "cute" is a breach of the site's guidelines. After all, cuteness is subjective, and one man's (and it is usually a man, in the Wikiverse) "awww" is another man's "meh". 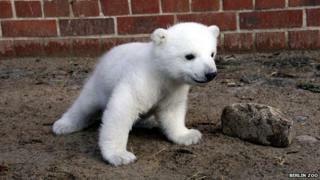 The cuteness disputation reached new heights in an edit war over the caption of an image depicting Knut, the polar bear born in captivity at Berlin Zoo - a decision was finally made to remove the term. Other "edit wars" are even more trivial, and many have been going on for years. Should Star Trek Into Darkness have a capital "I"? Are U2 an Irish band, or merely a band from Ireland? Is Jennifer Aniston American or American-born? Could she be Greek-American, English-American, or even Greek-and-English-American? Istanbul's not Constantinople, as the Four Lads conclusively asserted. But is it now Istanbul, or İstanbul. Notice the difference? There's a controversial dot, nay, an iota, over the "I". Some disputes have more noble aims, such as the to-and-fro over whether the entry for arachnophobia should feature an image of a spider (it doesn't). But it's the incessant nature of these disputes that puts many new editors, and crucially, many women, off joining the site. Roberta Wedge, a UK-based female Wikipedian who cut down her activity on the site after getting "fed up with some of the attitudes towards editors", explains that the editing environment can be very off-putting. "There was just too much argument behind the scenes that wasn't productive and wasn't useful," she says. "I don't get involved in that kind of dispute. I put my energy where it is useful," adds Roberta, who has now started editing regularly again. Wikipedia desperately needs new recruits. The proportion of editors identifying as female hovers between 8% and 15%, despite the goal set by Sue Gardner, the former executive director of the WikiMedia Foundation, to raise the share to 25% by 2015. Most Wikipedians are also from "Western" countries, and, perhaps unsurprisingly, rather "geeky". The demographic imbalance translates to a worrying imbalance in the topics covered on the reference site. As a case in point, there are more articles in the Lord of the Rings category than in the sub-Saharan Africa group. Wikipedia founder and chief cheerleader Jimmy Wales has repeatedly voiced his concerns about the demographics of Wikipedians. But, while he advocates the many programmes aimed at getting a more diverse group of editors, he insists that the adversarial nature of the Wikipedia community is ultimately a good thing. "Figuring out exactly where to draw the lines is a very complex topic, and I always want the community to keep having those debates," he argues, "because the minute we stop having that debate is the minute we start making mistakes." Indeed, devoted Wikipedians see edit wars as a natural consequence of what makes the site special - its collaborative nature. As David Gerard - a 47-year-old London-based computer systems administrator, who has been editing the site since 2004 - says, it is "literally true that nobody runs Wikipedia". Hence, "if you want to get anything done, you have to actually convince everyone to go along with you" and as a consequence, the "social environment can be very off-putting at times." "If I was going to sum up what's wrong with Wikipedia in a sentence," says David, "it's fundamentally the 'someone is wrong on the internet and they must be made right' problem." But the source of Wikipedia's problems may very well be the route to a solution. Perhaps no organisation is as comprehensively introspective as Wikipedia. Pages and pages have been devoted to discussing tactics for recruiting more women, and how editors can be more welcoming. Schemes such as "adopt-a-user", in which established editors are encouraged to mentor newcomers, have been introduced, as have calm discussion spaces such as the TeaHouse. But ultimately, as Roberta says, its down to people taking the plunge and getting involved. "If you see an absence of something, if you don't see yourself there, the invitation is there to help put yourself there".